Knotted-Thread: Oy, did it again.. I decided, just now, that I would join... another swap!! Okay, so I make it sound like a big deal, and I may have promised myself not to get overloaded with the holidays coming up and personal quilting that needed to be done.. 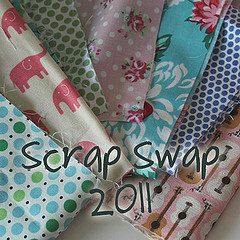 The lovely Kat is hosting a Scrap Swap and is taking sign-ups until Sept. 30th. It's a scrap swap with all of your combined scraps measuring approx. to a fat quarter, a small goodie and something that pertains to your area that you live.. it is international though, so if thats a deal breaker for anyone stop here.. BUT - if you find yourself like me and can't resist a good swap with such an amazing community of people.. JOIN! Sew Happy Geek is also organizing a swap that I couldn't help but join! Something different and new as well - check her out if you have any interest in this type of swap - signups are closing soon!! In other sewing news, I was actually productive last night but forgot to upload pictures, so that will wait till tomorrow.